ADVANCE REGISTRATION REQUIRED. Registration deadline is February 6th at Noon. Visitors must present a valid photo ID to building security on entry level. 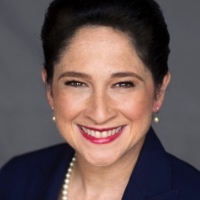 Join Susana A. Mendoza, Illinois Comptroller and previously a member of the Illinois House of Representatives. She is the first Hispanic independently elected to statewide office in Illinois. Susana Mendoza graduated from Bolingbrook High School where she earned All-State and All-Midwest honors in varsity soccer. As such, she became the first female to ever make it onto the Bolingbrook High School Wall of Fame. She attended Northeast Missouri State University (now Truman State University) on a soccer and academic scholarship, earning All-Midwest honors in soccer and a B.A. in Business Administration. She is very happily married to her wonderful husband, David Szostak, with whom she is sharing the joy of parenting an amazing 5-year-old son. They live on the City’s northwest side in the historic Portage Park neighborhood.